To Prepare the Calvados Sauce: Melt the butter in a 1 quart saucepan. Add the diced apple and sauté for about 5 minutes, or until soft. Add 1 teaspoon Calvados. Add the stock and bring to a boil. Reduce heat and simmer the sauce for about 15 minutes, reducing sauce by one-quater. In a cup, combine the cornstarch and cold water to make a paste. Pour this paste into the hot sauce, stirring constantly with a whisk to prevent lumps from forming. Bring to a boil again and simmer 2 or 3 minutes. Season with salt and pepper. Remove from heat and add remaining Calvados. Keep sauce warm. To Prepare the Apple: Peel, core and cut the apple into eight wedges. Melt 2 tablespoons butter in a small skillet. Add the apple wedges, sprinkle with the sugar and sauté, tossing frequently for 4 to 5 minutes until the sugar is lightly caramelized. Keep apple wedges warm. 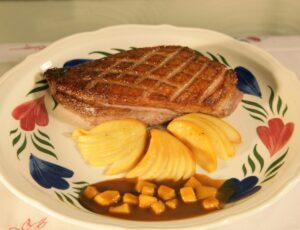 To Prepare the Wild Duck Breasts: Lightly salt and pepper the duck breasts. In a large skillet, heat remaining 2 tablespoons butter and 1 tablespoon oil. When butter begins to brown, add the breasts, skin side down. Depending on the size of breasts; for medium rare, sauté for 1 - 2 minutes then turn breasts and cook for an additional 1 - 2 minutes. Increase cooking time to suit individual taste. Remove from pan and allow to rest for 5 minutes. To Serve: Heat the sauce and keep warm. Thinly slice each apple wedge just short of each tip and fan out the wedge. Divide apple wedges between 4 ovenproof plates and place in a 200 degree oven to warm. 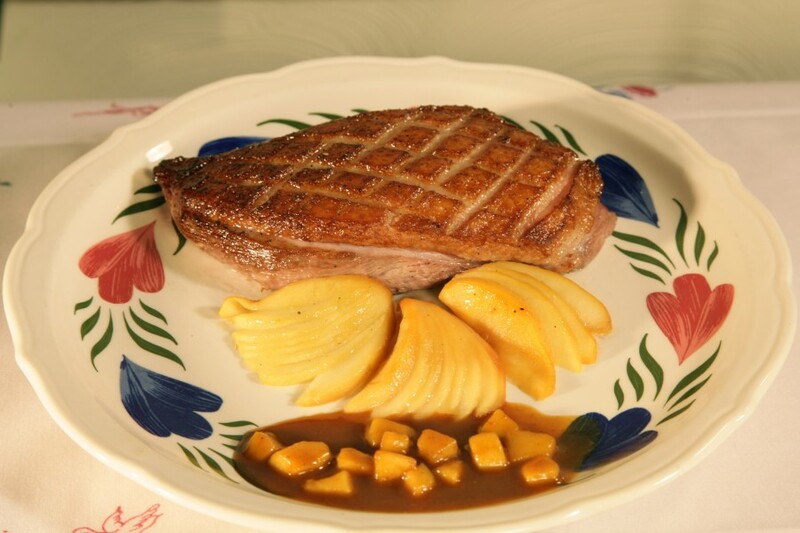 Cut duck breasts into diagonal slices and place one breast on each warmed plate. Pour sauce around the breast and serve.